I am so excited! I am going for a holiday! And it's not a local holiday. It's a trip to Guilin, China. I have already booked an AirAsia flight and paid RM559 for a return ticket. 1. I have never been to China before. This will absolutely be my first time there! Woo hoo! 2. I am going with a fellow blogger and his friend. The blogger is none other than Jam! Thanks Jam for inviting me to join you for this trip! 3. It's a 10-day trip! We will be departing from KL on 30th July 2009 and return on 8th August 2009. I have never gone for a holiday for that long! The most is 5 days! Now I can have 10 days of carefree time, without thinking about work and all the stress! Guess what? Me and Jam would like to invite fellow bloggers from Malaysia to join us for this trip! Well, for one thing, I need someone to share a room with me to save money. Haha! OK, I guess the main reason is it'll be more fun to go in a group and what's more, it's like a bloggers' trip! How cool is that? And don't forget, you will finally get to see me and Jam in the flesh! Now is that good enough reason to go on this trip with us? Haha! 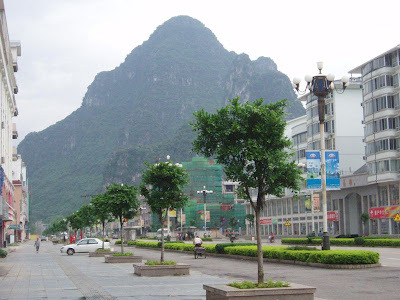 1) Guilin numerous peaks such as Elephant-Trunk Hill, Reed Flute Cave and many others. 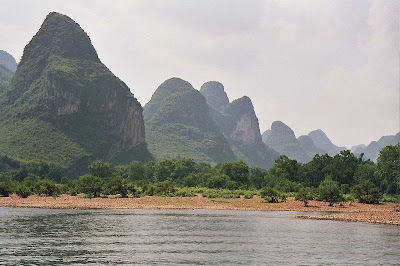 2) Li River cruise where you will see some of the most beautiful scenery in the world. 3) West Street in Yangshuo. 4) Impression on Liu San Jie, a cultural show directed by the director of Beijing 2008 Olympics opening ceremony. 5) Terraced field in Longsheng. 6) Experience the culture of Miao and Zhuang minority tribe in Longsheng. 7) Visit Xingping, a small fishing village nearby Yangshuo which was once visited by Bill Clinton. I googled some photos of Guilin and came away awed. 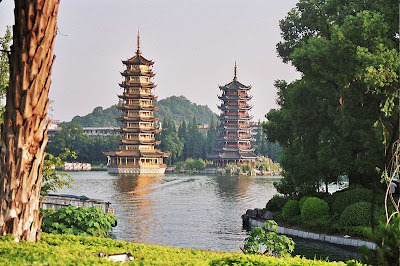 For those of you who have never been to Guilin, see these photos for yourself! So how much will this trip cost you? Well, if you like staying in 5-star hotels and dining in expensive restaurants, I don't think you would want to join us. That's because we are sort of back-packing on this trip and staying in just 2-star youth hostels or guesthouses. The total costs including airfare, accommodation, transport and food will come to about RM2,000. However, there are two conditions which you must agree before joining us. 1. We are not to share photos. Make sure you bring your own camera if you wish to take photos! 2. Since Jam and I are private persons and we value our privacy, we will appreciate if you do not post photos of us (including his friend) in your blog or on the internet. However, you may post photos of us with our faces blurred (though I still prefer if you post none at all). Well, what are you waiting for? Let me or Jam know if you wish to join us for this trip of the year! Yahoo yahoo!!! FC FC FC!!!! Wow, that sounds exciting! 10 days is a long vacation but is enough time to really experience the place. I'm looking forward to seeing your photos of the trip. wow! da scenery is breathtaking yo! wowowowowowwowo! Yahooooo! I love vacations and what a vacation to go on!! I am very, very excited for you and look forward to hearing all about it while you are there!!!! Congrats! Wow..Foong, so nice! I am sure you'll have a great time. I gather July - Aug would be mid summer isn't? Indeed an added bonus of seeing Jam and Foong in person :) I am definitely looking fwd to reading about your adventures in China! Oh and another thing..I can't backpack in China. This isn't my cup of tea. But for guys, it's definitely easier. Have loads of fun!! n just when i thought you're posting way too many photographs even though your trip has yet started, so you're recruiting. how i wish to join! Wow, sharing a room with you! I guess that effectively narrows down the search to males. :P Anyway, good luck in finding the perfect partner-in-crime! *LOL* And Guilin really does look pretty! Wow! That's nice! There are alot of beautiful scenery there. Too bad now peak season for me. >.<"
Lucky you. And the pictures of the scenery is so picturesque! YAY!!!!!! Ha ha ha ha ha so happy la Foong! First time see my avatar here YAY!!!! Good on you to post up such an interesting post. Already some one joining us? Let me know, ok? BTW, we are not only searching for male travelers. Females can also joining us, and of course we won't ask you to share the room with Foong, haha! Hello. Good luck on the trip. I love going out and learn new cultures as well. I have been to China several times but not yet to Guilin. When you come back and tell me it's good, I will GO! Before you fly there, you have already posted nice photos. Have fun dude! Aim for beijing next trip, you will love it. So excited for you. Yes, Guilin is famous for her beautiful scenery. Enjoy! Looking forward to your China series already. Great idea to lay down the rules upfront - better understanding for an enjoyable holiday. Good grief! That's still a longway to go! Personally, if I had the money, I would not go to any place in China! Sorry! LOL!! hey remember to take more photos and upload ok! woot! u'll be missing in action for 10 days? this is cool. the views are breathtaking indeed. Have fun Foong!! ;-) I've been to China but not Guilin..
RM2k for vacation abroad is worth it. I never been to China too. The airticket is cheap. Guilin is a beautiful place. I was there ages ago... it's pretty. mariuca, congrats for finally achieving FC on my blog! Haha! Wow! 2 weeks in Melbourne - I also don't want to return home after such a long holiday! Nope, don't think I will ever post my picture here as I value my privacy. If want to see me, gotta meet up with me. Haha! babette, yes, 10 days is definitely enough, though if I have a choice, I don't mind going even longer than 10 days! annant, too bad! It'll be fun if more bloggers were to join! levian, haha! yes, the photos to entice you all. And why can't you join us? rad, 6 months holiday? I wish I can have 6 months holiday! I need to work lah, if not where to get money to go for holidays? iamthewitch, I don't mind sharing the room with you if you don't mind! Haha! Even if you don't mind, I think Saucer will mind! haha! jam, I'm afraid so far, no one has agreed to join us. I think I don't mind sharing room with female bloggers, so female bloggers are all welcome! LOL! khengsiong, so far only me, Jam and his friend. No gals. You going for a trip or you go 'kow lui'? Haha! I actually booked the ticket last week. Don't think the price has changed much. happysurfer, thanks! Yes laying down the rules so everyone understands before joining. Wow! Countdown? You make it sound as if it's countdown to some very big event! LOL! Maybe I should put a countdown clock on my blog! Haha! nic, don't worry! You will get close to us during the trip lah! No need to be scared. We definitely won't kidnap you. Muahaha! life ramblings, yeah missing in action in Malaysia for 10 days! But will be full of action in Guilin! Haha! faisal, aww, that's a pity! I'm not sure whether it's easy to get halal food there. What do you think, Jam? RM2K is worth it, but don't forget we are back-packing and only staying in 2-star hostels. eastcoastlife, Singaporeans can join in too! It's just that for Malaysians, we can go together by meeting up at the airport and go on the same flight together. Maybe Singaporeans can meet us there at Guilin airport. I bet it is going to be fun & exciting since this is your first trip. Have fun and wish you luck on finding someone to go along with you. Replying to Faisal comment: we could possibly eat halal too, we used to eat those in Malaysia anyway. But I dare not to say anything about eating in China. Even though we can order halal food, we don't know what cooking oil they use and also their cooking utensils. Another thing, Foong is right! Planning ahead always get you cheap air ticket. Now I am planning for 2010 Tibet trip via Chengdu. I will most probably book my ticket when AirAsia launches its KL-Chengdu flight end of this year! can I come onot? I can share your room but must warn you I snore very loud wan! :P then we wont ever get to see ur face? i want to save money to go hokkaido!!!!! Just have to make sure that you got your visa and all your documents are in order. Seems that the visa officers are quite particular. booo hooo hooo... jealous saya! i m stuck here n u are happily announcing ur holiday! so nice pics there some more.. ai ya ya!!! Enjoy your trip at the Beautiful Guilin! And don't forget to share with us the photos! Oh, this is too cool to be true! Ten days vacation in another land? There's nothing more awesome than that so hope you take pictures and show it to us! And I heard that in China, internet usage is kinda restricted. Don't know much about it! wow!! nice scenic pictures!! But too bad, need to save more money for rainy days especially during this credit crunch period. Zaini has similar opinion as suituapui. After a few bad experiences in China (actually have to blame the tour guide not the Country itself) he's sworn off China altogether. shionge, yes very exciting indeed! Thanks, but I have yet to find anyone willing to join me! wuching, I think I snore too but don't know how loud! I think I snore loudest when tired. So yes, you can come. I'll just wear a earplug to sleep. Haha! Hokkaido is a nice place to visit - definitely must save money for that. Such an expensive place!! half crazy, thanks! It's awesome indeed! I don't know if the internet access in China is restricted, but it's OK, can always go online only when I return. You know, sometimes you would want to take a break and go offline for a whole week! Wah so happening ah you and jam. But I don't have the money for such a trip so I have to decline. If anybody wants to have a piece of Islam in China they should visit the Xinjiang Autonomous Region in western Chine. & not to mention being chased down the road by beggars in Shenzhen! lina, oh that's horrible! Sorry to hear that you both had such horrible experience! If I were you, I also won't want to go back! But I think the problem lies in your tour agent - I thought they should make sure the tour guide knows how to speak English, but I guess if most of the travelers are Chinese speaking, they won't bother. And how could they make it compulsory to buy the photos! I'm sure they tried to earn as much as possible from you all by giving you some lousy hotel and taking you to places not in the itinerary to earn more commissions. That's why I sometimes don't like to go overseas using tour guides unless they have good reputation. hey there. 1st time drop by. War...so good! Can go there for 10 days! I have never been to any foreign country before. Not even SIngapore! I'm so out! =P Anyway your trip sounds fun and interesting! The pict of the scenery is really scintillating! How I wish I can be there too. i like Yang Shuo to Guilin. I was there twice. Those places in the pictures are a must see! ayie, yes they are a must see alrite! Have you been there? ayie, I guess they have to preserve the structures as those are tourist attractions and helps bring in the revenue. I already had it in my list about travel blog but put it on hold since we haven't been travelling much lately. For the meantime those places that I've been will be shared in my photo journal blog.